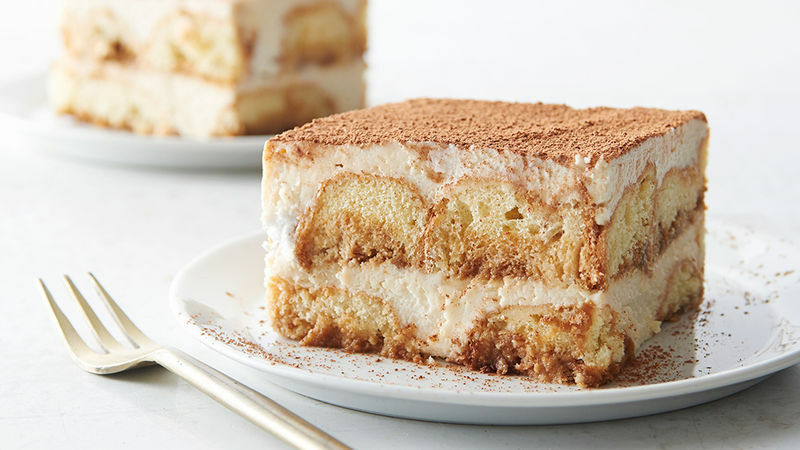 In large bowl, beat mascarpone, 1/2 cup of the powdered sugar, the coffee liqueur and vanilla with electric mixer on medium speed until smooth and creamy. In medium bowl, beat whipping cream and remaining 1/4 cup powdered sugar with electric mixer on medium speed until stiff peaks form. Fold into mascarpone mixture. Pour espresso into shallow bowl. One at a time, dip both sides of 12 donut halves into espresso; arrange in single layer in ungreased 13x9-inch pan. Spread one-third of the mascarpone mixture over donuts. Dip remaining donut halves into espresso, and arrange on top. Spread remaining mascarpone mixture on top. Cover and refrigerate 4 hours to set. Sprinkle top lightly with cocoa just before serving. Store covered in refrigerator. Be sure not to overbeat mascarpone mixture; overbeating can cause the mixture to stiffen and become difficult to spread over donuts. Store leftovers covered in refrigerator up to 3 days.